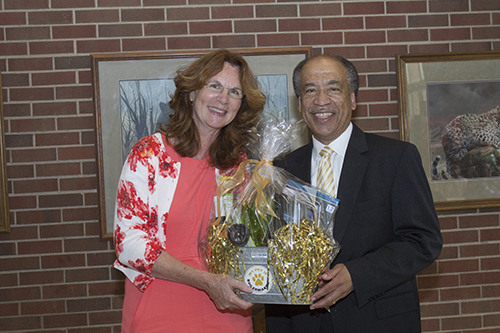 Dean Willie Reed presents Dr. Ann Weil with a token of the College’s appreciation for her 15 months of service as interim director of the Veterinary Teaching Hospital. Dean Reed concluded by explaining the good news is that Dr. Weil is not going anywhere. “She will continue to support the hospital and carry on and be a major contributor like she has always been.” Dean Reed then presented Dr. Weil with a gift basket in recognition of her service to the College and encouraged everyone at the reception to take a few moments to visit with her and thank her for what she has done. The College’s new Veterinary Teaching Hospital director, Dr. Duncan Hockley, officially started yesterday (Thursday, June 1), and is currently going through an orientation program. 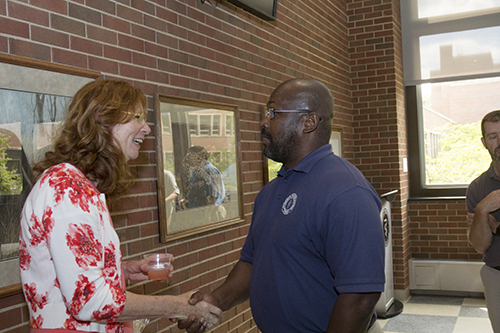 Dr. Darryl Ragland, associate professor of food animal production medicine, visits with Dr. Ann Weil at her Thank You Reception. 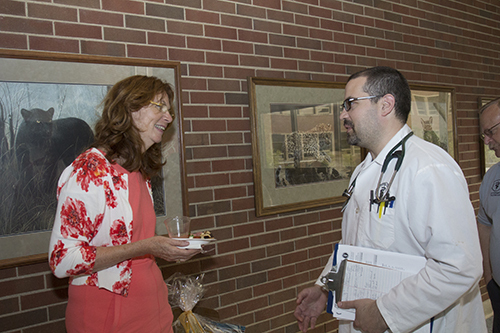 Dr. Ann Weil greets Dr. Ewan Wolff, small animal internal medicine resident, at the reception held in honor of her service as VTH interim director.